Many geckos inhabit trees, often living high in the canopy. Relying on their incredible adhesive strength to help them break their fall, they jump from trees, and land on either leaves or relatively smooth tree trunks. How they withstand these impacts and what forces are imposed on the toepads of such falling/jumping geckos is not well understood, and could be critical to understanding the phenomenal adhesive power that these lizards exhibit. A team of researchers led by a biologist at the University of California, Riverside now reports in the Royal Society Interface journal that the gecko adhesive system may reach its functional limits in extreme situations, such as when a gecko—seeking, for example, to escape a predator— falls/jumps from the canopy of a rainforest. "We found that the size of the gecko and the size of the leaf determine impact forces," said Timothy Higham, an associate professor of biology at UC Riverside, who led the research project. "In contrast to previous research that suggests that gecko frictional adhesive capacity is excessive relative to the body mass that it supports while at rest or running up a vertical surface, we show that realistic conditions in nature may result in the gecko's frictional capacity being pushed to its limit. Geckos, we found, are subjected to impact forces that approach or exceed the safety factor of a single foot, leading to the possibility of injury or a failed landing attempt." 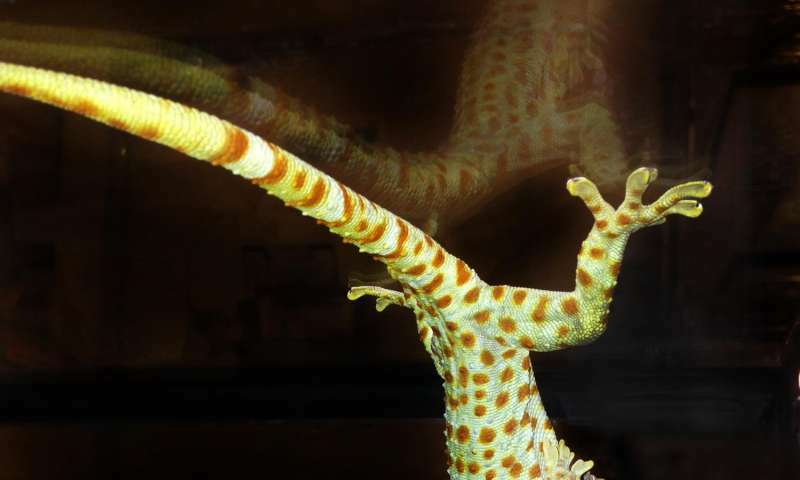 Higham and two other scientists on the project—Anthony P. Russell, University of Calgary, Canada, and Karl J. Niklas, Cornell University, NY— developed a modeling framework to assess whether geckos' adhesive capacity ever reaches a limit in nature. They based this upon published observations of aerial descents of canopy-dwelling geckos that are interrupted mid-fall when the geckos cling to leaf surfaces. "Many geckos catch themselves mid-fall, by sticking to a leaf as they plummet earthwards, suggesting that the rapid deceleration that they experience might provide the selective force that is responsible for driving their strong adhesive capacity," Higham said. "This study, therefore, could provide insight into the evolution of adhesion - a topic not fully understood." The researchers used published observations of geckos in their natural habitat in the Amazon region. In the lab, they took measurements of frictional adhesive capability. They also estimated aerodynamic forces, maximum impact forces, and subsequent loading on the adhesive system upon impact for the geckos. Higham noted that in their experiments, he and his colleagues assumed the gecko stops immediately following impact with the leaf surface. "However, it is likely that it could slide along the leaf surface following impact, which would reduce the impact force experienced," he said. "While it's true that landing on plant surfaces following escape-induced jumps can result in very high impact forces that challenge adhesive capacity, these can be mitigated by the bending of the leaf and/or stem." According to Higham, one way to imagine the challenges faced by such geckos in suddenly arresting their falls would be to think of a skydiver reaching terminal velocity and then grabbing a support in mid-fall and stopping without using a parachute to slow down. Next, the researchers will travel to French Guiana in the fall to obtain video (in high speed) of the landing of geckos on leaves. "We will combine canopy observations and field experiments with artificial landing platforms," Higham said. "Basically, we want to compare the results of our model with the actual forces of landing in nature."